The Golden State Warriors gave the Detroit Pistons a shot at an upset, turning the ball over more than they had in any game this season. They made up for mistakes by making a lot of shots. Draymond Green had a tiebreaking dunk with 1:31 left and Kevin Durant scored 32 points despite playing in foul trouble, lifting Golden State to a 119-113 victory on Friday night. Golden State had a season-high 23 turnovers, surpassing the 20 it had in a 20-point loss Nov. 4 against the Los Angeles Lakers. 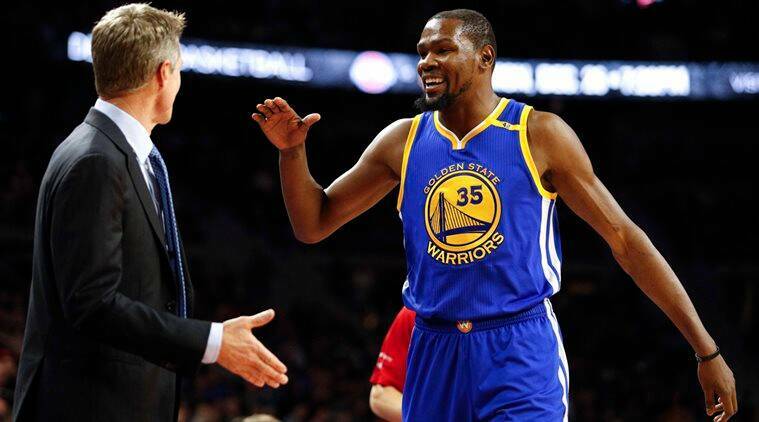 The NBA-leading Warriors have won seven straight, rolling with their new star, Durant, as they head into their Christmas NBA Finals rematch in Cleveland. Stephen Curry had 25 points and eight assists, Klay Thompson scored 17 points, including two on a lead-padding jumper with 22 seconds to go, and reserve JaVale McGee added 15. Golden State made 56 percent of its shots and was 11 of 27 from the 3-point line. The Pistons have lost five in a row. Detroit’s Tobias Harris scored a season-high 26 points in his first game this season off the bench. Kentavious Caldwell-Pope had 25 points, Reggie Jackson scored 17 and Andre Drummond had 15 points and nine rebounds. ”When your team plays that hard and you still can’t guard them, I need to look in the mirror because we didn’t give them a good enough game plan,” Van Gundy said. Warriors: Green scored just five points, but had game highs with 12 assists and 10 rebounds in his return from a one-game absence. Green said he was on an airplane in New York before it took off for San Francisco on Thursday morning and watched the birth of his son, Draymond Jamal Green , via FaceTime. He spent the day with his newborn son and girlfriend, Jelissa Hardy, in California before rejoining his team for Friday night’s game. The forward had the option of staying home, but said it would’ve been selfish to accept the offer because his son and girlfriend were healthy and his teammates have kids of all ages they leave behind for games. Pistons: Jon Leuer replaced Harris in the starting lineup and it might’ve served to motivate Harris. ”As a player, you shut up and put your big-boy pants on and play,” he said. Van Gundy was pleased with how Harris handled being a reserve. ”He was disappointed by not starting, and got a season high plus seven rebounds,” he said. ”That’s a professional, professional performance. The lineup change didn’t help Detroit early, as it fell behind before rallying in what was a closely contested game the rest of the night with 18 lead changes and 10 ties. In his first start of the season, Leuer had eight points, slightly less than his 11.2 average and fewer than the 17-plus points he scored the previous three games. Van Gundy looked and sounded livid the Pistons left Green open for a back-door cut on his go-ahead dunk late in the game. The Pistons announced Friday they will retire Richard Hamilton’s No. 32 jersey on Feb. 26 at halftime of a game against the Boston Celtics. The former Connecticut star, who led the Pistons in scoring in eight of nine seasons, helped the franchise win the 2004 NBA championship and advance to at least the Eastern Conference finals six years in a row. The Warriors helped the Pistons pack The Palace and many in the sellout crowd of 21,012 were rooting for the visitors. ”I’ve been a fan in this building a lot of times, and I know the people here don’t cheer for visiting teams, so it shows what being on this team is like,” said Green, who is from Saginaw, Michigan, and starred at Michigan State. Warriors: Play at Cleveland on Sunday. Pistons: Host the Cavs on Monday night.